The Chinese Yuan has lost around 8% against the US dollar since its late March 2018 peak, thanks largely to Donald Trump's war on trade with China. With more volatility expected, how can traders try to take advantage, and most importantly, protect themselves along the way? On 22 March, Trump signed retaliatory tariffs on up to $60 billion of Chinese imports. Everyone expected China to respond, which they did. However, analysts expected someone would eventually give in. Here we are now, several months later with Trump having placed over $250 billion in tariffs on China, with a view to increase that amount even more. Apple have publicly stated that Trump's trade tariffs will hurt their company. Can Trump really afford a fight with corporate America and Wall Street? China is seeking permission from the WTO to place sanctions upon the United States - a move that will escalate the trade war even further. Rumours are circulating that China are devaluing their currency to offset any tariffs from Trump. This is just one of the reasons why the Chinese Yuan has dropped so much over the past few months. It certainly looks like more volatility is on the way. Before we look at the possible ways to take advantage of it, let's first look at how we can access this market. 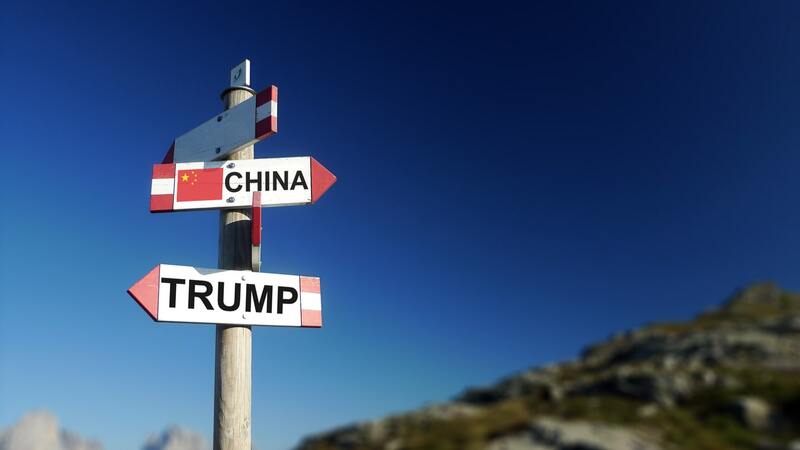 While every market is affected in some way by Trump's trade war with China, the US Dollar and Chinese Yuan is where most traders will be looking for opportunity. However, it's important to know that there are two Yuan currencies: the Onshore Yuan (CNY) and Offshore Yuan, also known as the Offshore Renminbi (CNH). The Renminbi (CNH) was established because China wanted to internationalise their currency without fully opening up their market. That is why they still have the Onshore Yuan currency, which is fixed and controlled by the government and not tradeable. So, if you want to capitalise on the volatile US Dollar and the Chinese Yuan Market, the USDCNH is the instrument to trade. The chart above shows the daily candles of the USDCNH currency pair. As the exchange rate rises, the US Dollar is appreciating against the Offshore Yuan, or Renminbi. After a significant surge that occurred between April to August 2018, recent price action shows that the market is now ranging between a multi-month high of 6.9582, and a multi-week low of 6.7847. There are multiple ways to trade in such a situation. But let's focus on how to trade the current scenario: a ranging market. Range based trading is best suited to short-term traders, as no single buyer or seller is dominant in the market. In this scenario, range traders could use market behavioural patterns like the pin bar reversal, which formed on USDCNH on 28 August 2018. For example, If a trader entered the market at 6.8141, with a stop loss order at 6.7846, the trader would profit when the USDCNH trades above their entry price, plus the spread (the difference between the buy price and sell price of a market). If the exchange rate stayed at or below their entry price, then the trade would be in a loss. However, the loss would be limited to where the stop-loss is placed. Trading one standard lot of 100,000 units would result in an approximate USD430 loss. If the trader decided to exit the trade on the first daily candle, then the trade would have been closed on 30 August at 6.8660, resulting in an approximate $747 profit. An important consideration to remember is that these are unprecedented times. No one knows how deep this trade war will go, or even what the longer term impact of it will be. Therefore, the market will likely be sensitive to different headlines from Trump and China respectively. So, how can traders protect themselves from these unexpected events? Well, one way is to always trade with a stop loss, so you know how much you could lose if your trade goes against you. This way you can effectively manage risk in your account properly for long term trading, rather than blowing yourself out of the water on just one or two trades.